So, now seems like a good time to share a quilt I made last month for my cousin and his wife's new baby. My cousin is a graphic designer for the Texas Rangers. He's a third-generation die-hard baseball fan and they decorated the baby's nursery with a baseball theme. The Rangers provided all of their front office staff with tickets to all the World Series games. He and guest (who might not be his wife, she's like 36 weeks pregnant) even get to attend the away games on the Ranger's dime (airfare and hotel included.) The home games are like going to work for him since he works at the stadium. Exciting stuff for a baseball fan though. This quilt isn't made with fabric I would normally choose, but I like that it's sports and novelty without looking too, you know... like the licensing aisle at Joann. The print is Alexander Henry and the solid is Kona Stone. I pitched these wonky squares together quickly and they really seem to like it. The label is my favorite part. I think it turned out cute. So, that's probably all the baseball you'll ever get out of me. But, I do hope the Rangers do well and score lots of touchdowns in their first World Series game tonight. No, it's either a Birdie or a Bogie, I can never remember which! Super cute! Nice touch with the label, I love those kinds of details! Hahahaha! 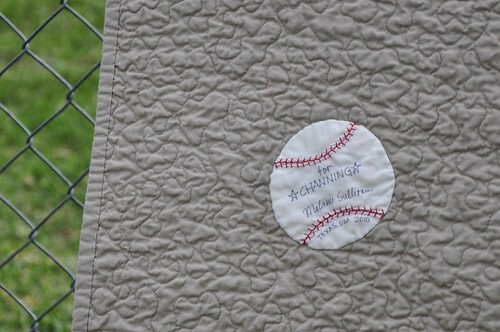 You almost got me... Love the squares with the baseballs - and, I agree, the label is adorable. What a perfect quilt! Love the label! Cute quilt! Even my 2 1/2-year-old grandson and 4-year-old granddaughter know they are to root for the Rangers. Because...they are DODGERS fans, which seriously was like their very first word. and the label is perfect. That's really cute, Melanie! That reminds me to post the pictures I took of some of the quilts at the State Fair. 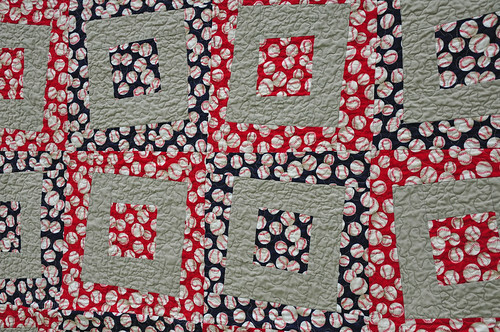 There was a baseball fabric one that I thought was pretty stunning. Great play, Melanie! Pretty darn cute quilt too. Love the label. My husband says that baseball is the only game you can mow the lawn and watch at the same time. But we are Dodgers fans and hope Vin Scully, the beloved annoucer who is now in his 80's, continues as long as possible. Nothing says summer like the sound of a baseball announcer. Yes, I totally agree with you about baseball. It's way too slow and boring for me and as much as I love reading your blog, this fan is a GIANTS fan baby. I'm from the Bay Area (including SF area) so I'm rooting for the GIANTS...but I will still read your blog everyday...good luck to your team!! Great quilt. I just found your site through your beautiful fabrics on Spoonflower and thought it was hilarious that you were a Rangers fan (sort of). Like many of your other commenters, I'm also a Giants fan who just came home from a World Series party to do some blogging. Baseball aside, you've got some really great stuff. Glad to stumble across your site. 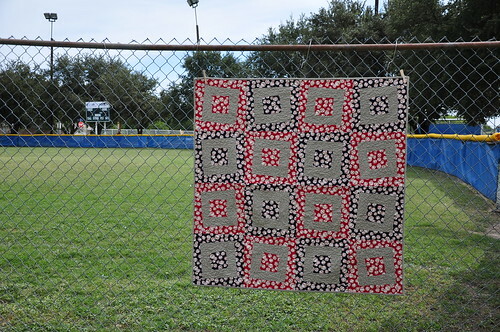 I just LOVE the graphic look of this quilt and the colors too! Awesome choices for a fun result!